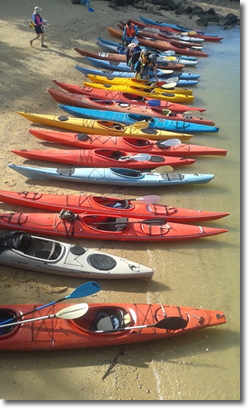 Paddle Asia is the premier company in southern Thailand that uses proper traditional decked sea kayaks. Other paddle-powered boats in use in southern Thailand include inflatable canoes and plastic or fiberglass sit-on-top kayaks. Each of these has its specific usefulness, yet both fall short of the thrilling experience that you can have when paddling a real sea kayak. Kayaking adds a new dimension to your traveling experience. If you appreciate quality and inherent value, a modern traditional kayak adds a new style to an old form of travel. Traditional kayaks are considered the standard worldwide. Our modern traditional kayaks are a perfect blend of craftsmanship and art. It's where the time-tested ancient meets the modern. They are comfortable and very efficient. Efficiency translates into added comfort. Our sleek kayaks slice through the water. Furthermore, we have a huge selection to suit all body sizes. Your comfort is very important to us. The standard boat for all other paddling tour companies in southern Thailand is a sluggish sit-on-top. They are cheap in price and design. Suitable for resort use and piddling about in a small pond, they are disappointingly slothful when coastal and open ocean paddling. If sit-on-tops were really an improvement over the time-honored traditional kayak, wouldn't operators all over the world be switching? Quality tour operators still use real kayaks! Our philosophy is "Quality without compromise." Your vacation is too valuable to spend laboring in a barge when you have a delightfully efficient alternative. Don't be confused by cheaper imitations. New doesn't necessarily mean better. Traditional decked kayaks are a clear choice when only the best will do. Inflatable canoes are useful for entering the hongs (hidden rooms within sea caves) in Phang-Nga Bay, and for float trips on quiet rivers. Their best attribute is their ability to be rolled up. This makes them transportable. They are also extremely stable, which makes them advantageous for beginners, people with physical disabilities and photographers. They are, however, extremely sluggish and boring to paddle. 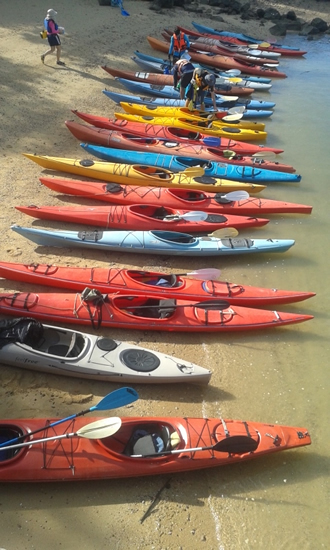 They aren't really considered sea kayaks by most kayakers. Sit-on-tops are good for calm-water or mangrove areas which require high maneuverability. They are not good touring kayaks! They are suited for short distances for people who don't get much exercise or who aren't really interested in learning traditional kayaking techniques. Most operators in southern Thailand use sit-on-tops for their kayak tours. With a traditional decked touring kayak, the paddler is an intimate part of the boat. The paddler's feet are resting on footrest and his/her knees are pressed against "thigh braces" under the deck. Modern kayaks have very comfortable seats. To customize the seat and to gain more control, many paddlers attach hip pads to the sides of the seat. This increases the control, it's something that cannot be done with an inflatable canoe and it would be very difficult with a sit-on-top. Some sit-on-top kayaks have a thigh strap option. This is still not as secure as a rigid deck to brace against. Our Khao Sok National Park kayaks are sit inside recreational kayaks, which are wider, more stable (better for watching wildlife), and very comfortable. 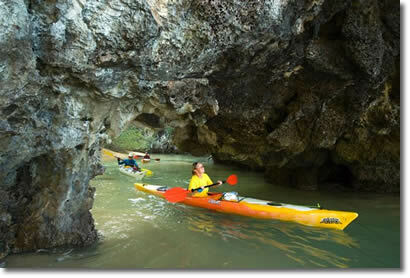 As the main thrust of our Khao Sok trip is seeing wildlife, we don't use proper touring kayaks. One of the most important kayak techniques is bracing. Bracing is a maneuver used to prevent capsizing. A strong brace is one of the hallmarks of a good paddler. It is almost impossible to perform a proper brace in an inflatable canoe. The flat-bottomed design makes inflatables very stable, but once the boat is tipped over too far, it simply capsizes. A more rounded hull, like those of the majority of sea kayaks, allows the paddler to recover stability with a brace. Leaning is also a sign of an experienced paddler. It is used to enhance a turn or to surf sideways on a wave. Sit-on-top paddlers could do a brace only if they have thigh straps. Most popular brands of sit-on-tops are plastic and feature very weak plastic cleats as attachment points for the thigh straps. They often pop out… usually resulting in a capsize. The key to understanding why sea kayaks are a better choice for anything except the above situations is the efficient use of energy. In a given period of time, a person will take a certain number of strokes, requiring a certain amount of energy output. When paddling either an inflatable canoe or a sit-on-top kayak, the expenditure of energy produces limited progress. Neither craft is well suited to distance paddling or ocean conditions. When paddling a traditional sea kayak, the entire design and construction of the boat is aimed at maximizing energy efficiency. There is a joy in being in a long, sleek, efficient kayak that reaches back in time to the very early days of kayak development and use in the Alaskan Aleutian Islands and in Greenland. The pleasure of exploring the rocky coast or headland of a lovely island is best experienced not in a noisy longtail boat, nor a fast powerboat, not even in a yacht. To be near the rocks, watching sea birds and crabs, looking down at coral and fish; this celebration of tropical ocean touring is best done under one's own power, in a fast, maneuverable, stable, traditional sea kayak. We are the only ones who do what we do!